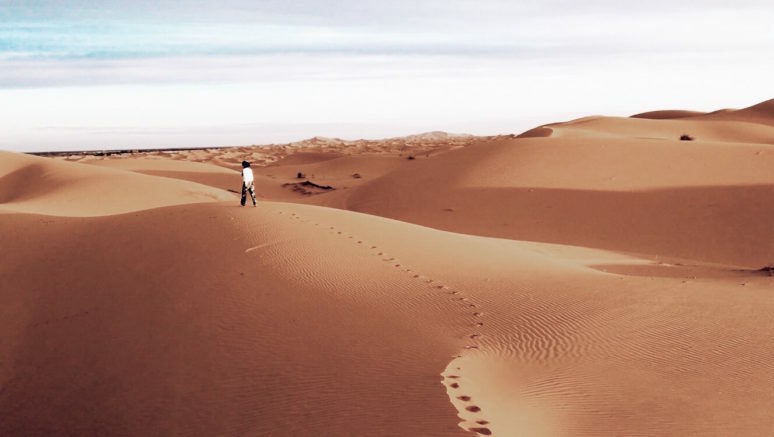 This past March I visited Morocco and not only did I want to do the usual activities in Marrakech, I most definitely wanted to see the Sahara Desert. 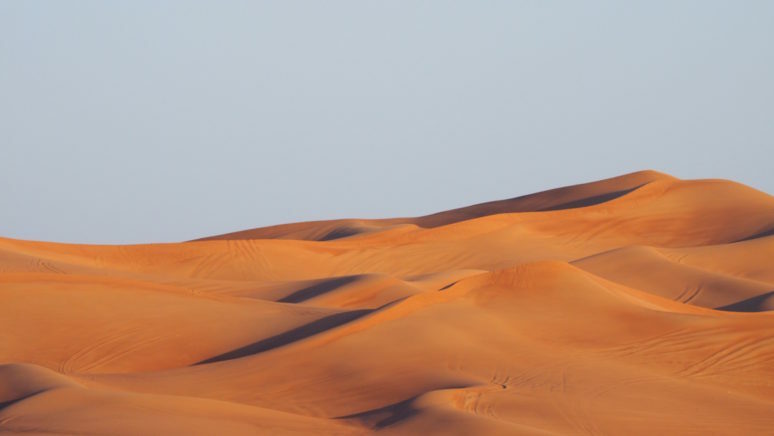 The Sahara, the world’s largest non-polar desert, is something that most people aren’t going to see in their lives, let alone spend the night camping in its dunes. Morocco has two areas of dunes and I chose the Erg Chebbi next to the town of Merzouga. The dunes here are more expansive, taller, and frankly much grander than those of the Erg Chigaga a little farther south. And I didn’t come all the way to the Sahara to see small dunes. I wanted those giant, movie-worthy, blowing peaks and that’s exactly what you’ll get in Merzouga. Merzouga is a town about a nine hour drive from Marrakech (a gorgeous scenic route over the Atlas Mountains and into the desert). The town is literally on the very edge of the sand and because of that you will find hotels with the dreamiest views overlooking the dunes. I chose the Kanz Erremal not only because it’s very inexpensive, but because the pool grazes the dunes. 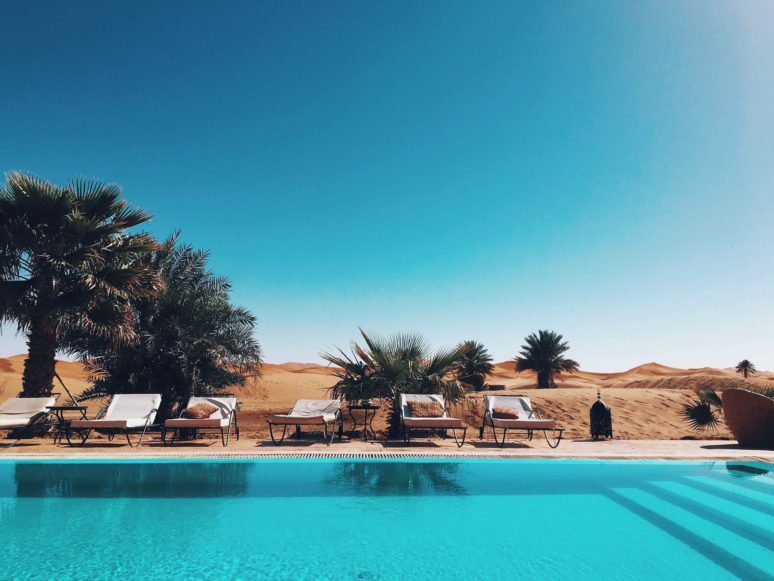 Make sure you request a room that faces the desert because the view from your window will be something unlike anything else you’ve ever seen. This hotel will arrange overnight trips into the desert for you, but I wanted a little more of a lux experience. Glamping if you will. 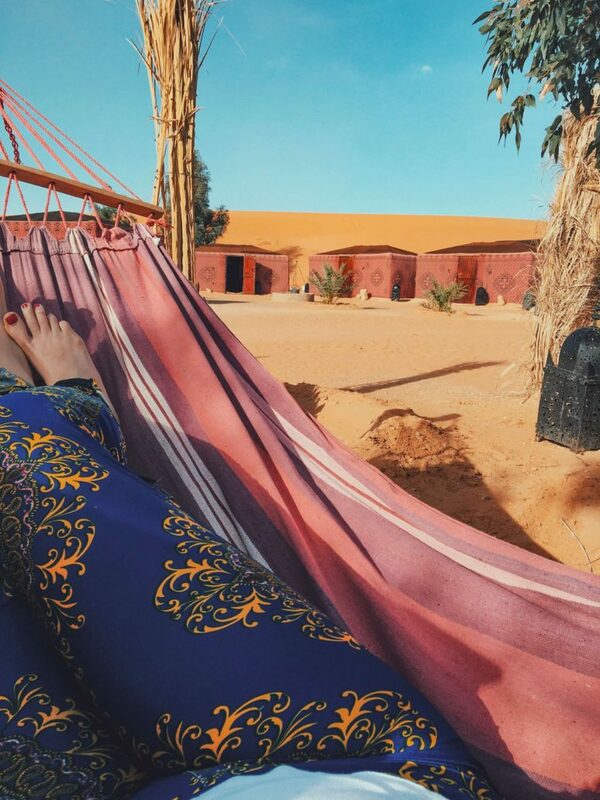 There are dozens of camping companies in Merzouga for all ranges of budgets. The lower end will get you a basic tent and no bathroom (you go in the sand!) while the upper echelon is full on comfort and extravagance. I chose Ali and Sara’s Desert Palace. It’s not the most expensive, but it’s more at the higher tier of all the camping outfits in the area. 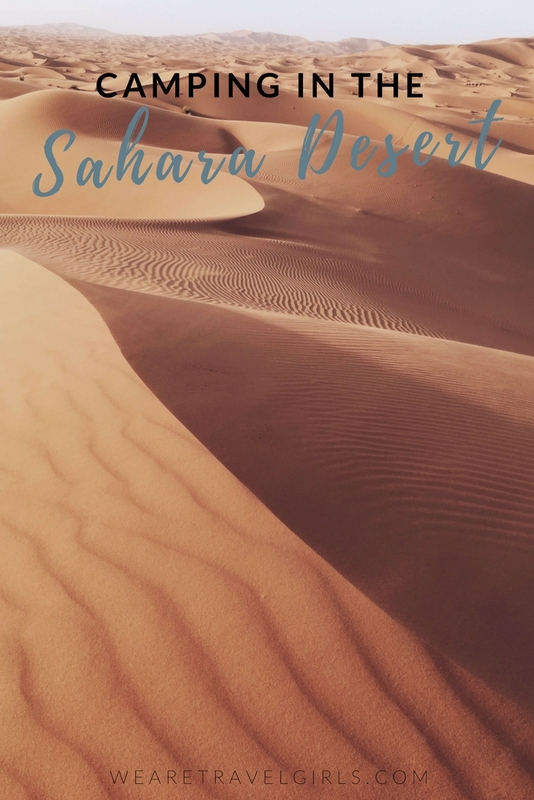 I typically travel very budget conscious, however I thought that a splurge on a Sahara camping adventure was worth it. 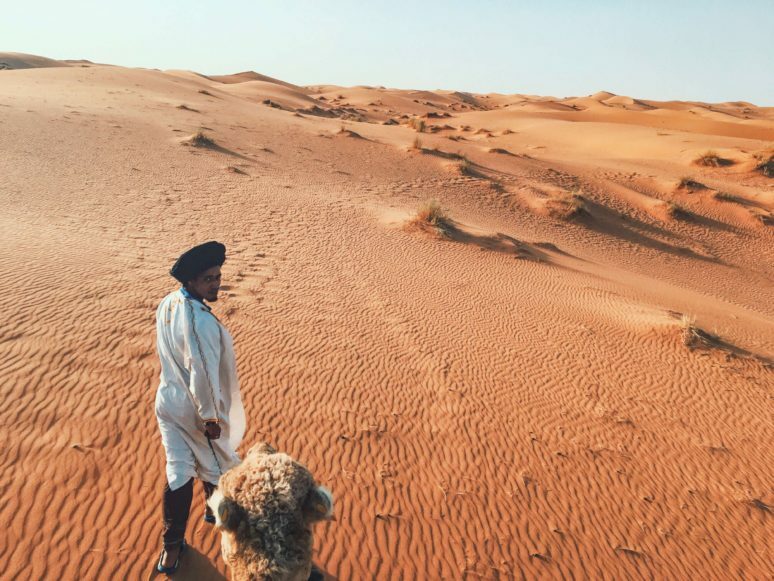 Nearly all of the overnight desert treks, no matter what company you choose, include a tent, food and the camel ride out and back. Ali and Sara’s includes a 4×4 to and from the camp, tea, wifi (! ), dinner, sunset camel trekking, sunrise camel trekking and breakfast. The beautifully decorated tents contain an actual full bed (with really heavy bedding, it can get cold at night!) and each tent has its own private bathhouse. The bathhouse has an average western toilet, vanity and hot water shower. The 4×4 trip out to the camp is an adventure all its own as I bumped and rolled through the sand, the dunes getting bigger and bigger the farther I got out. I passed a few other camps on the way but once I arrived, I felt very, very secluded. I relaxed in a hammock and drank some mint tea and soon it was time to head out to watch the sunset. Riding a camel is no easy feat. It severely bucks as it gets up and down but your assigned “camel man” is very happy to help you not fall off. It’s also not the most comfortable ride, but once you get out into the silence of the dunes, you forget all about your sore rear. This particular camp offers sand boarding, but because I’m very bad at snowboarding, I went sitting down like a child in a sled. It was just as much fun! After playing in the sand for a while, the group of us staying in the camp watched the sun go down over the small town way off in the distance. We all got back to camp right at dark and the staff had dinner nearly ready. One thing about visiting Morocco is that you will never go hungry. As a matter of fact, you are usually still so full from your previous meal that you never actually get hungry. Ali and Sara’s Palace pull out all the stops for the meals, serving course after course after course of the most delicious breads, tajines and couscous dishes. When I thought I couldn’t take any more they brought desert. After dinner the staff, who are all local Berber men, built a large bonfire and drummed and sang the songs of their tribe. I was really moved by this and they even let us try the drumming patterns. I was not good at it. I had the option to wake up at 4am to ride the camels back out to watch the sunrise. That is something I was definitely not going to miss, so I woke up and fumbled around and attempted to hitch myself onto a giant animal while half asleep. The camel man built a fire as the sun arose over the massive dunes and over Algeria off in the distance; the colors of the sky lit up like a kaleidoscope. It was so silent and quite frankly, magical. Back at camp, breakfast was just as big of an event as dinner and I left the camp stuffed, as per usual Moroccan standards, with the most amazing memories and stories of what I had just experienced in my head. If you are ever in Morocco, I can’t stress enough how worth it it is to make the trip to Merzouga and experience camping in the Sahara. 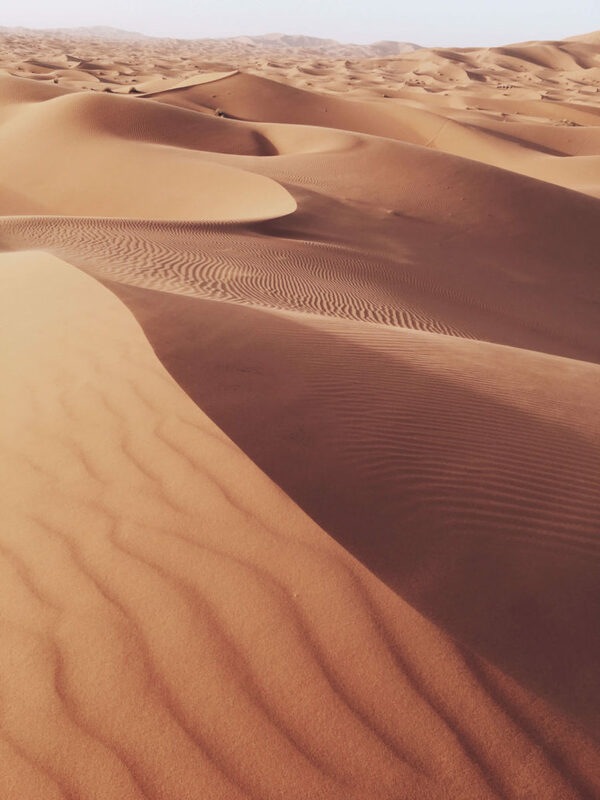 You will be one of the few people in the world who can say they’ve not only seen and walked in the Sahara Desert, but spent the night in it listening to the sounds of Berber music echoing across the mountains of sand. 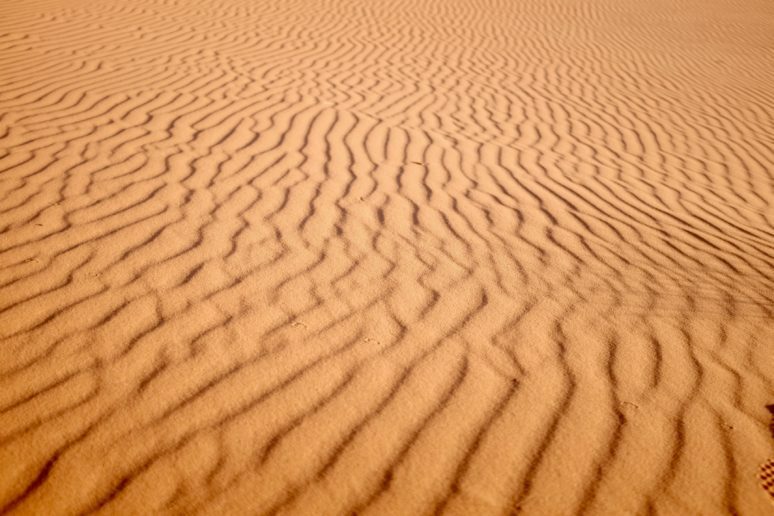 Have you visited The Sahara Desert or someplace else in Morocco? Please share your experience with our readers in the comments below. 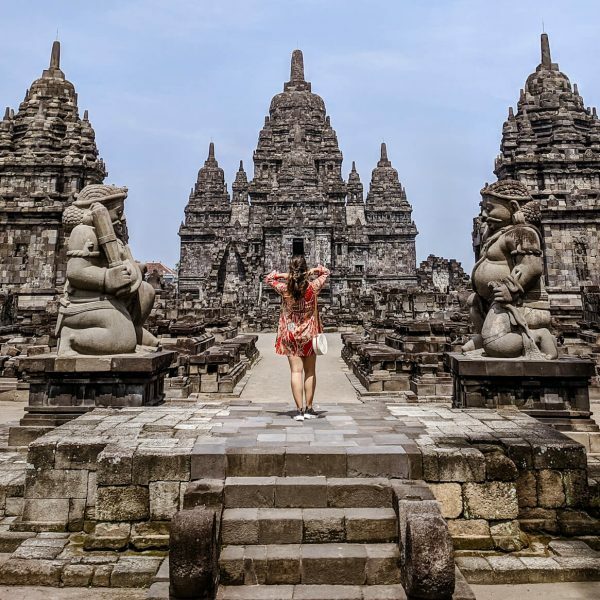 Samantha, you are a beauty and a travel inspiration! Can’t wait to see where in the world you will take us next! 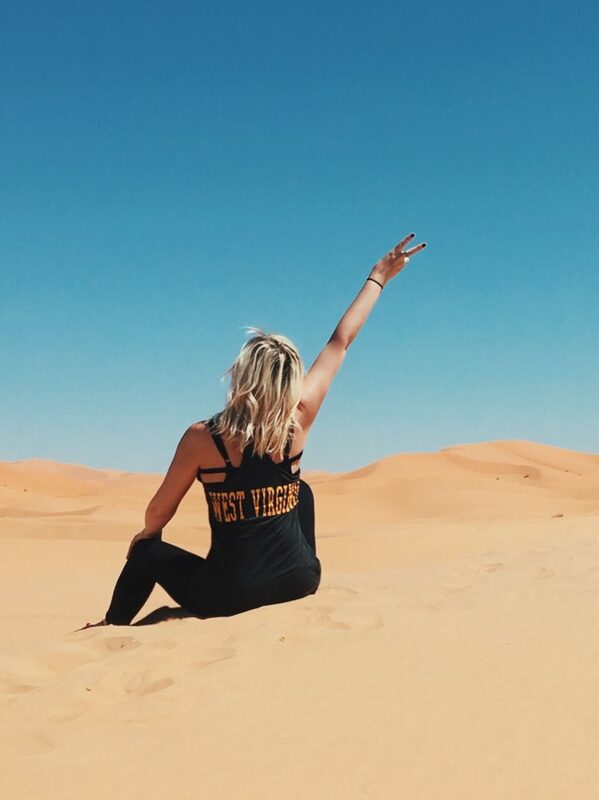 Zhanna, you would not regret morocco! Majestic is the perfect word for it. You’d loooove the glamping, it’s worth the little splurge. Thanks for reading Zhanna! 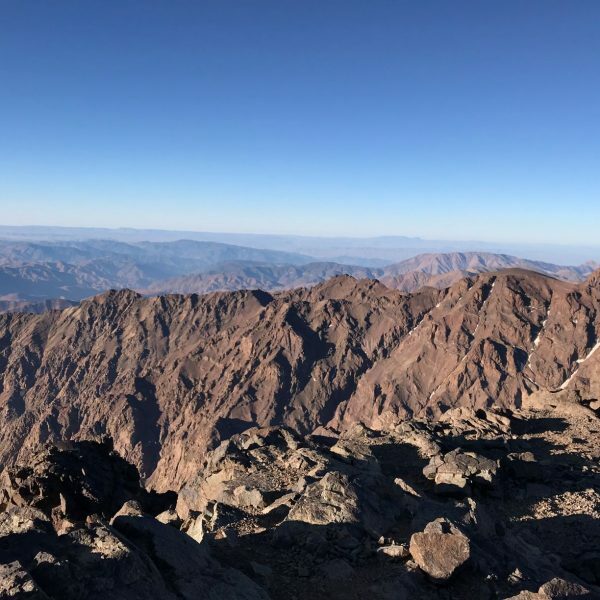 Camping the desert is a really cool experience, sometimes its not a nice as in this article though! 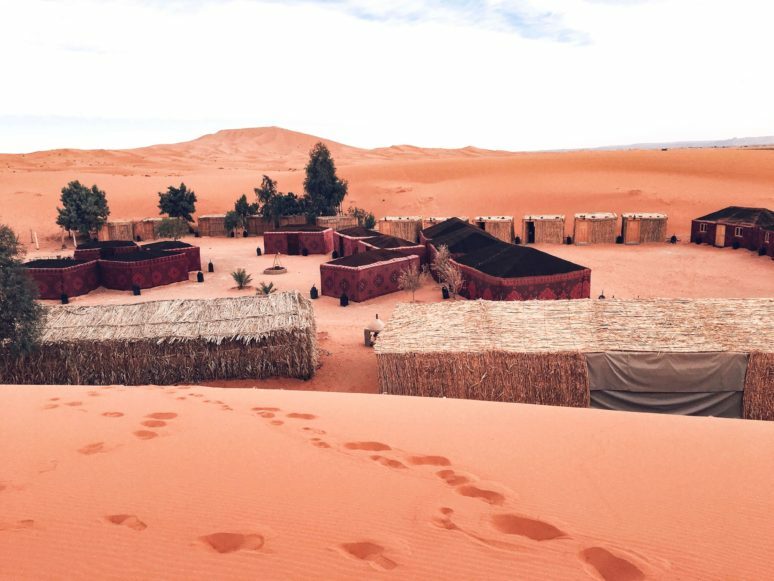 If you want to see the other side of glamping in the desert check out my article > http://beckyvandijk.com/prepare-night-moroccan-desert/. Hopefully its a funny read! WOW, Great idea! I will definitely try it on my next camp trip. I think it will be a wonderful time! 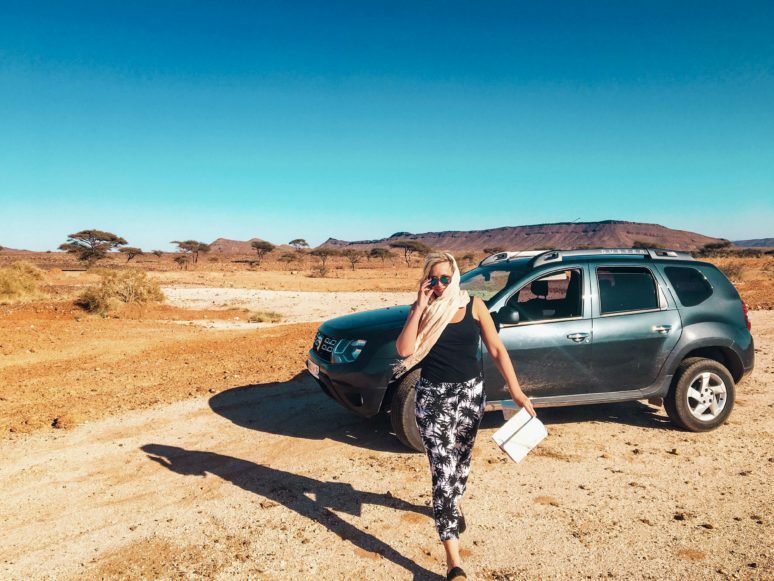 Great article… just wondering how you travelled from Marrakesh to Merzouga? I was looking at some of the 3 day trips from Marrakesh but you don’t have the option of staying in a hotel of your choice and I’d love to stay in the Kanz Erremal. Morocco is an amazing country! 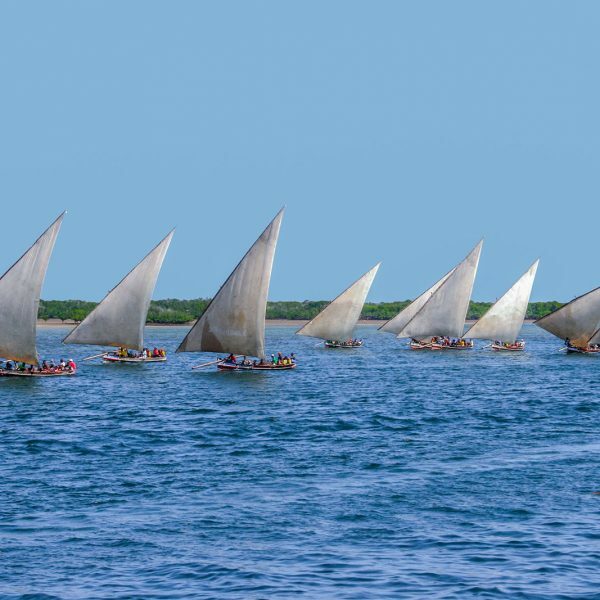 variety of landscapes and interesting sites to visit from Imperial cities, Atlas mountains to the magic Sahara desert. Thanks a lot for your interesting posts!